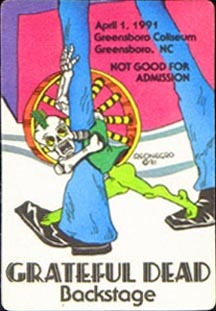 Greensboro Coliseum , Greensboro, N.C.
near the end of jerry’s solo (at end of song) he gets turned up dramatically. it sounds great! a lot to the jazzier side of the Dead. REVIEW: the Greatest Birdsong ever?? Beautiful sound on a seriously epic show with with Bruce rollin’ please take a listen;-!! I shirtless hippy in the upper deck yelled, “Jerry, play Dark Star” and they did. my first seeing the Dead. It was probally the best period since the late 1970s. shows and the first night of Orlando were a glory to behold. I miss ya, Jer…. 1/2 a joint from between the seat cushions and said “what’s this?”….I had a little explaining to do. not broken with any amount of dead air. J.R.’s Old Packinghouse Cafe, Fri., Apr. 5th, 6:00 p.m.
Siesta Key Oyster Bar, Wed., Apr. 3rd, 7:00 p.m.
Marina Jack’s Patio Bar, Thurs., Apr. 4th, 6:00 p.m.
Gilligan’s Bar & Grill, 5253 Fri., Apr. 5th, 6:00 p.m.
Stottlelmyer’s Smokehouse, Sun., Apr. 7th, 3:00 p.m. The Clever Cup Coffee House, Sat., Apr. 6th, 6:00 p.m. Linger Lodge, Sat., Apr. 6th, 7:00 p.m. The Mable(formerly Growler’s), Sat., Apr. 6th, 9:00 p.m.
Tues., Apr. 2nd, Lauren Mitchell with Bill Buchman, 7:00 – 10:00 p.m.
Wed., Apr. 3rd, Al Fuller Blues Jam, 7:30 – 10:30 p.m. Thurs., Apr. 4th, TRusty Wright Band, 7:30 – 10:30 p.m.
Fri., Apr. 5th, Laura Rain & The Caesars, 8:00 – 11:00 p.m. Sat., Apr. 6th, Sugar And Spice Review, 8:00 – 11:00 p.m. Sun., Apr. 7th, Truality gospel brunch, 11:30 a.m. to 2:30 p.m. Mon., Apr. 1st, Open Mic with Rick Alvis, 7:00 – 10:00 p.m.
Tues., Apr. 2nd, Steve Paradis, 6:00 – 9:00 p.m.
Wed., Apr. 3rd, Frankie Lombardi, 6:00 – 9:00 p.m. Thurs., Apr. 4th, sToneFish, 6:00 – 9:00 p.m.
Fri., Apr. 5th, Florida Mountain Boys, 7:00 – 10:00 p.m. Sat., Apr. 6th, Bonfire Jam Band, 7:00 – 10:00 p.m.